A.B. Richards has been honored to serve the state of New York for their storage container rental needs for over the past three decades. A.B. Richards offers portable storage space in NY for small business owners, storage for sports equipment for local sports teams like The Long Island Ducks, larger storage container rentals for contractors and storage for homeowners who are renovating. When it comes to storage container solutions in NY, A.B. Richards has set the bar. Fill out the form or call us at (800) 597-5971 for a free quote for renting storage containers in NY! A.B. Richards serves many different counties of New York as well as a wide selection of towns. If you reside in The Empire State, then A.B. Richards is the best place for your storage solution needs. See below to see the areas we proudly service in New York. 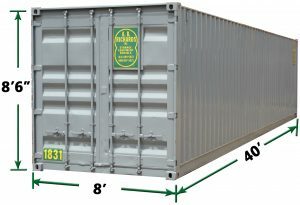 Three Storage Containers Sizes in NY! 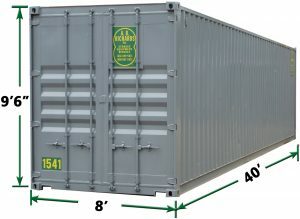 There are three different sizes of storage containers to rent or lease. The first is a 20 foot storage container. We recommend this model to be used for small storage needs such as homeowners looking to renovate or small business owners who needs additional storage for record keeping. The next size is a 40 foot container, which we recommend for manufactures or wholesalers who needs space for excess inventory. 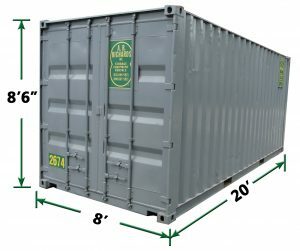 And our third option is a 40 foot Jumbo container. This has extra space vertically, ideal for large, awkward items or contractors looking to store their construction equipment. Our dedicated and trained staff members will help you select which container will fit your storage needs. Not only that, we deliver and pick up all of storage containers, so it’s never been easier to rent or lease a storage container! Just had my storage container delivered last week. Everything was smooth and painless. Monthly cost was the cheapest in the area. Recommend them to anybody looking for a portable storage solution on Long Island. – Brett Suffolk County, New York. For more information about our storage container rental in New York, contact A.B. Richards today!